Indie Retro News: Grimoire Heralds of the Winged Exemplar - A grand Dungeon Crawler releases TODAY! Grimoire Heralds of the Winged Exemplar - A grand Dungeon Crawler releases TODAY! 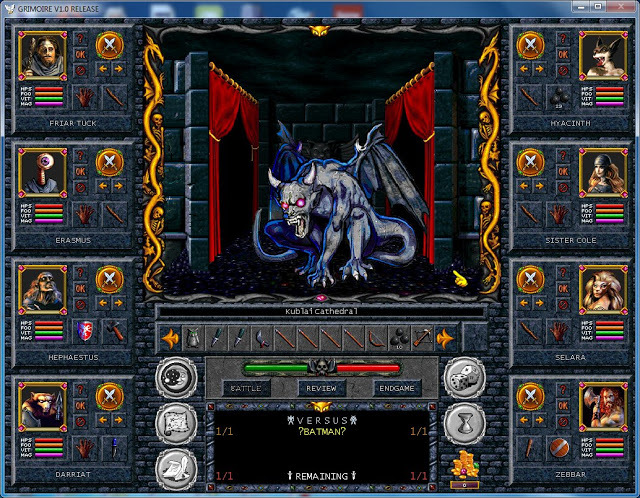 Once again we are writing about Cleveland M. Blakemore's retro inspired Dungeon Crawler ' Grimoire Heralds of the Winged Exemplar'; a hyped up dungeon crawler which has been in development for many many years and was due to be released some time ago. Well after finally ending up as a Steam Greenlight success and then missing its May 29th release date, this game will be released today(8th July) at the shockingly high price of $39.95! If you've followed all of our write ups previously you would've found out that Grimoire is looking to be a massive Dungeon Crawler with over 600 hours of play possible in a single game, with 244+ maps to explore, multiple starts and endings, 14 races, 240+ monsters, 1000's of items, retro style midi music, automapping and pretty much everything you could think of that needs to be in a dungeon crawler. So keep watching the Steam page, as the game is due to be released at any point from now.